We spent a ton of time researching and testing to find the best carbon block available while still being reasonable when it comes to price. There are other filters that work well however do not last as long. By simply just looking down the center of the carbon block you can see why the Universal Carbon blocks are superior to the competitors. If you have a well, or city water the universal blocks will work for everyone in almost all reverse osmosis systems. I love in a area with high chloramine, I was told I should install two, but I could only purchase one. It's running an noticed a large difference. Tested water no chloramine. I'm still going to add the second one next week. So it did work. Buy this. I will nit buy any other for my system! Works well. 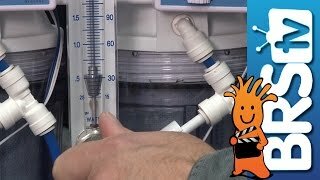 Takes our hard chlorinated water down to a very respectable 6ppm saving on ro membranes. I make around 35 gals a week, these last me well over 6 months without passing chlorine or plugging up. Also just replaced my RO membranes that lasted 3 & 1/2 yrs using this filter. It does what it's supposed to do, I recommend it. I regularly use the Matrikx CTO .6 micron carbon block but decided to give this 1 micron universal a shot because the rep on the phone said it's the best. Well it's not. I use the ROsave.Z sediment pre-filter and I only use 1 carbon block and this universal has slowed my psi rating much faster than the Matrikx .6 block does. I also am having another issue with it. I assembled my own RO/DI system from BRS 10" canisters and fittings. I never had an issue with any other carbon block, but it seems this one is slightly too long for some reason. Water will gather in the crease between the canister and the lid, like the lid can't close tight enough. So besides getting half the performance (a 1 micron vs a .6 micron) and then it lasting less time when it should be lasting longer, it's a no brainer to stick with the Matrikx block that's a few bucks cheaper. Replacing carbon blocks on rodi 6 stage should i use 2 of these or should i use one of these and a 5 micron carbon block? We recommend two of the 1 micron universal carbon blocks for best coverage of chloramines in the water. Feel free to let us know if you have any further questions! Who makes them and where are they made? Thanks for getting in touch with us. We are unable to offer contact information at the manufacturers request. Although, these blocks are produced in India. What is the length on these units? I have a 10" RO canister with 1/2" ports (purchased from BRS) I would like to use for this filter, will it fit properly? The Universal Carbon Block will fit all of our 10" canisters just fine. Most of our RO systems however use 1/4" ports which may be something to watch out for. Feel free to let us know if you have any further questions! How can I tell that it's time to replace the carbon block? By my water pressure reducing or does it start to stain? Any other way to tell? With the pressure drop from where it typically is. This is the easiest way. You can also test the water coming out of the carbon block with a chlorine test strip to ensure it is removing the chlorine. Whats the difference between a 1 micron and 5 micron carbon block? I am currently using Catalytic Carbon in my stage 2 flilter, can i use these instead ? and i am using chlorplus 10 carbon block in stage 3. I am purchasing the BRS Universal Carbon Block Filter - 1 Micron, as stage 3 of a 4-filter home system. 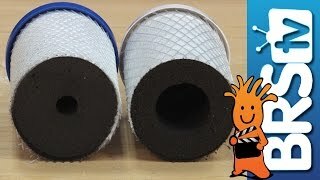 Stage 1 and 2 are sediment filters, this carbon filter, and a ceramic final filter. 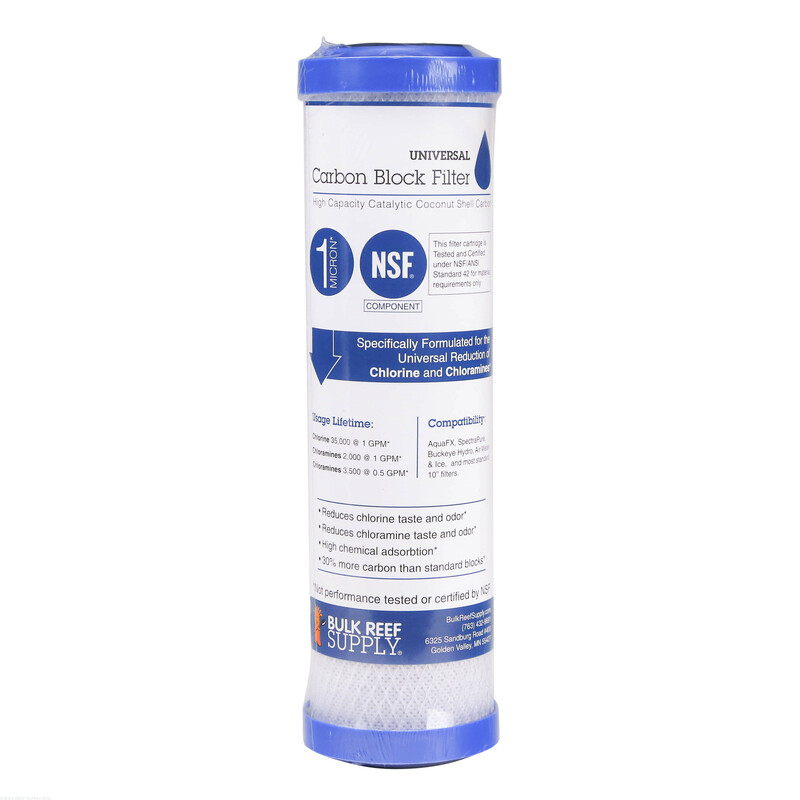 Does this BRS Universal Carbon Block Filter - 1 Micron remove fluoride from the water? If not do you have any filter that will remove fluoride? Hey there! We sell the RO systems which include an RO membrane and appropriate housing. RO membranes are where the actual filtration occurs and removed up to 99% of all fluoride from the water. You will want an RO membrane to remove these elements. 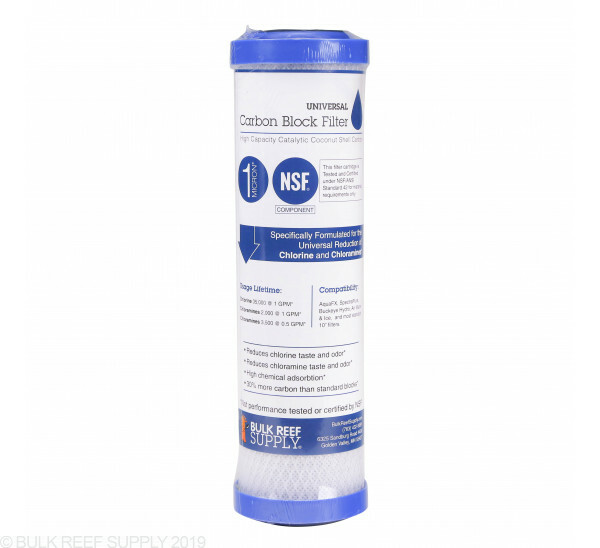 Do you need to, or is it better to use catalytic carbon ahead of these blocks for chloramine reduction or are the good on their own? They are rated for 3500 gallons so if you run a dual set up does that double your block life to 7000 gallons? Overall for best chloramines coverage you will want to use two 1 micron Universal Carbon Blocks. We have created a video on this exact topic included below! Overall the extra carbon block will not double the life however will ensure the RO membrane has better protection and it will have a small increase on time spent. Feel free to let us know if you have any further questions!